One of our readers messaged us on our Facebook page and he want to know how to install the Custom ROM on Oneplus 2 phone. So here in this tutorial we’ll show you how to do the same and flash your favorite custom ROM on oneplus 2. Android is one of the best OS and comes with lots of feature and one of the best thing is openness of the Android platform if you are unhappy with the Stock ROM then you can easily install some other Custom ROM on your phone. A new ROM comes with new features and new tools that you can’t find on the stock ROM. There are a lot of different ROMs out there, and if you want to try anyone of them on your phone. 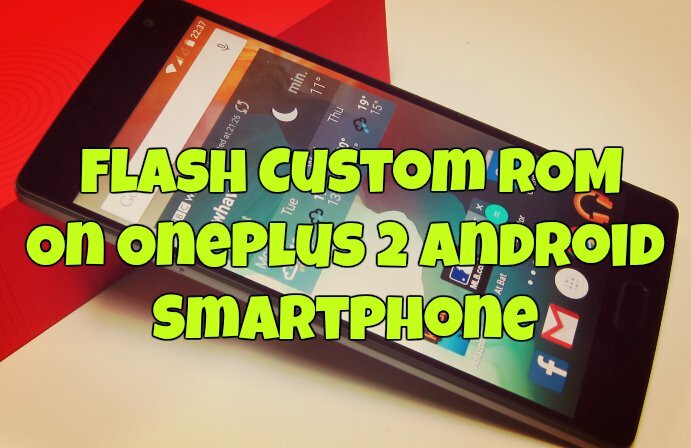 Chech this tutorial and flash your favorite ROM on your phone. To get started, you need a rooted oneplus 2 with TWRP recovery, Custom ROM zip file, and Google Apps package zip file. The process is very simple and takes a few minutes. But before that do take the backup of your phone, here is our guide to take the full backup of your Oneplus 2. Step 1. As we already mention above to do this you need a rooted phone with TWRP recovery. Read here how to do that and follow the step 2. Step 2. Now download you favorite custom ROM zip file and Google Apps Package Zip file. And move both the zip file on your phone internal memory. Step 3. Once both the files are saved on your phone, reboot your phone in TWRP recovery mode. Check here how to boot oneplus 2 in recovery mode. Step 4. 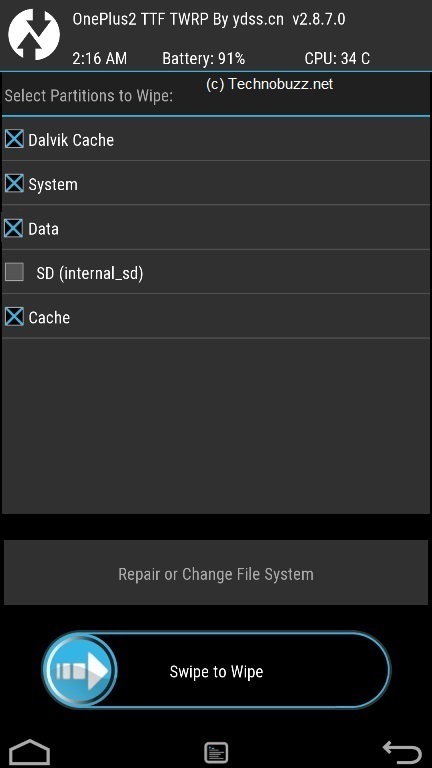 Now from the recovery menu, Select Wipe > Advanced Wipe > Select Dalvik Cache, System, Data and Cache then swipe to wipe. Step 5. Choose “Install” from the main menu. Browse your file system and find the ROM zip file and Flash it. Step 6. After that Flash the Google Apps Zip file. Step 7. After this Go back to the main menu, Reboot and you should see your new ROM boot up. If you get to the Welcome screen or your phone boots, congratulations! Now your phone is running on the custom ROM. Technobuzz Facebook Page <--- If you like this post, please Like Our Facebook Page Here, thx!